In a food processor add the garlic and cilantro and process until chopped. Add the lime juice, avocados and water. Pulse until nice and creamy. 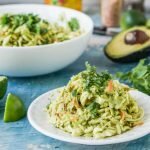 Take out the avocado mixture and in a large bowl mix it with the coleslaw. It will be a bit thick but it will cover the slaw nicely. For best results, refrigerate for a few hours before eating to soften the cabbage.